Welcome to the first lesson in the Multispectral imagery in R - Fire & Remote Sensing Data module. In this module, you will learn how to use multispectral imagery, a type of remote sensing data, to better understand changes in the landscape and how to calculate NDVI using various multispectral datasets You will also review spectral remote sensing as a passive type of remote sensing and how to work with space-borne vs airborne remote sensing data in R. Additionally, we will cover raster stacks in R, plotting multi-band composite images, calculating vegetation indices and creating functions to make the processing more efficient in R.
Define spectral and spatial resolution and explain how they differ from one another. Describe atleast 3 differences between NAIP imagery, Landsat 8 and MODIS in terms of how the data are collected, how frequently they are collected and the spatial and spectral resolution. Describe the spatial and temporal tradeoffs between data collected from a satellite vs. an airplane. You will need a computer with internet access to complete this lesson and the data for Weeks 7-9 of the course. In the previous weeks of this course, you learned about lidar remote sensing. If you recall, a lidar instrument is an active remote sensing instrument. This means that the instrument emits energy actively rather than collecting information about light energy from another source (the sun). This week you will work with multispectral imagery or multispectral remote sensing data. Multispectral remote sensing is a passive remote sensing type. This means that the sensor is measuring light energy from an existing source - in this case the sun. 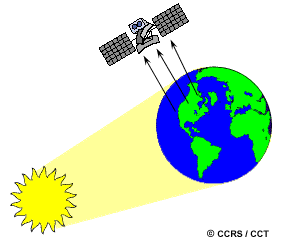 LEFT: Remote sensing systems which measure energy that is naturally available are called passive sensors. RIGHT: Active sensors emit their own energy from a source on the instrument itself. Source: Natural Resources Canada. 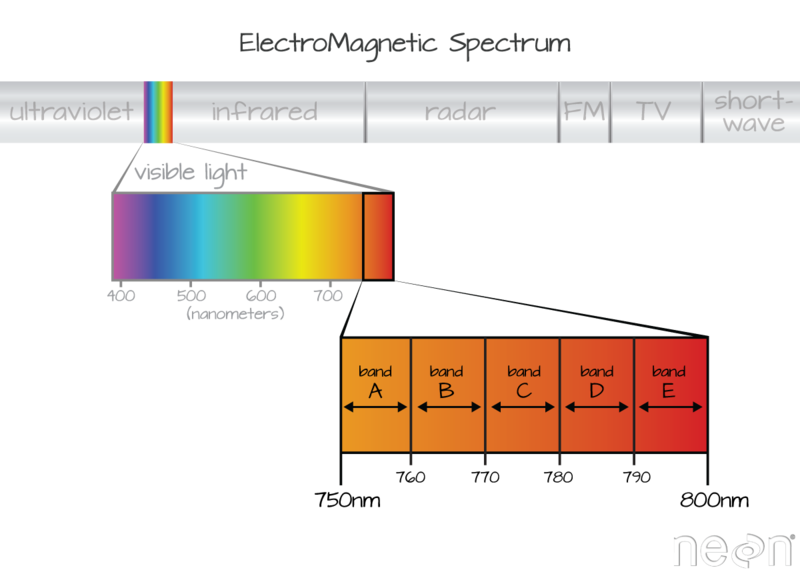 To better understand multispectral remote sensing you need to know some basic principles of the electromagnetic spectrum. The electromagnetic spectrum is composed of a range of different wavelengths or “colors” of light energy. A spectral remote sensing instrument collects light energy within specific regions of the electromagnetic spectrum. Each region in the spectrum is referred to as a band. Above: A video overview of spectral remote sensing. Above: Watch the first 8 minutes for a nice overview of spectral remote sensing. 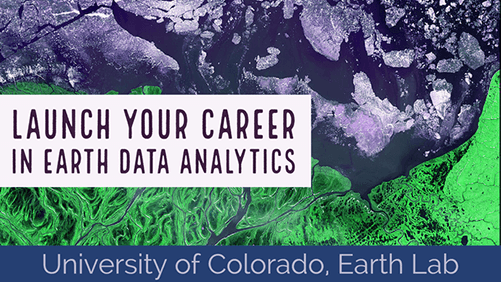 Remote sensing data can be collected from the ground, the air (using airplanes or helicopters) or from space. You can imagine that data that are collected from space are often of a lower spatial resolution than data collected from an airplane. 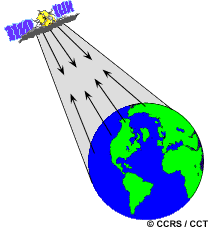 The tradeoff however is that data collected from a satellite often offers better (up to global) coverage. For example the Landsat 8 satellite has a 16 day repeat cycle for the entire globe. This means that you can find a new image for an area, every 16 days. It takes a lot of time and financial resources to collect airborne data. Thus data are often only available for smaller geographic areas. Also, you may not find that the data are available for the time periods that you need. For example, in the case of NAIP, you may only have a new dataset every 2-4 years. A band represents a segment of the electromagnetic spectrum. You can think of it as a bin of one “type” of light. For example, the wavelength values between 800 nanometers (nm) and 850 nm might be one band captured by an imaging spectrometer. The imaging spectrometer collects reflected light energy within a pixel area on the ground. Since an imaging spectrometer collects many different types of light - for each pixel the amount of light energy for each type of light or band will be recorded. So, for example, a camera records the amount of red, green and blue light for each pixel. Often when you work with a multispectral dataset, the band information is reported as the center wavelength value. This value represents the center point value of the wavelengths represented in that band. Thus in a band spanning 800-850 nm, the center would be 825 nm. Imaging spectrometers collect reflected light information within defined bands or regions of the electromagnetic spectrum. 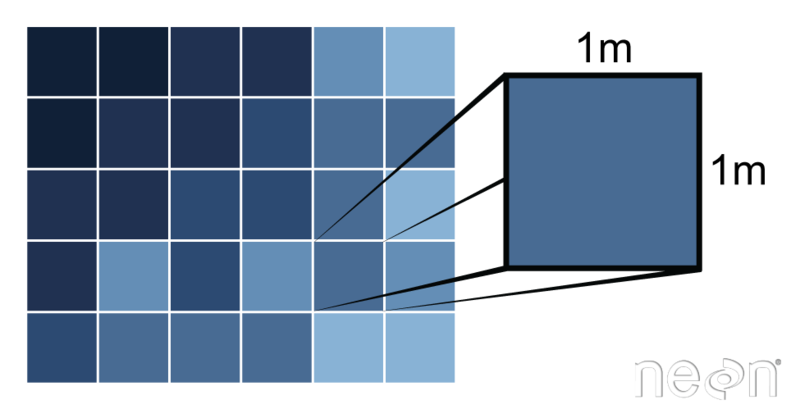 The spectral resolution of a dataset that has more than one band, refers to the spectral width of each band in the dataset. In the image above, a band was defined as spanning 800-810 nm. The spectral width or spectral resolution of the band is thus 10 nm. To see an example of this, check out the band widths for the Landsat sensors. While a general spectral resolution of the sensor is often provided, not all sensors collect information within bands of uniform widths. If high resolution data shows you more about what is happening on the Earth’s surface why wouldn’t you always just collect high resolution data (smaller pixels)? If you recall, you learned about raster spatial resolution when you worked with lidar elevation data in previous lessons. The same resolution concepts apply to multispectral data. The spatial resolution of a raster represents the area on the ground that each pixel covers. Source: Colin Williams, NEON. 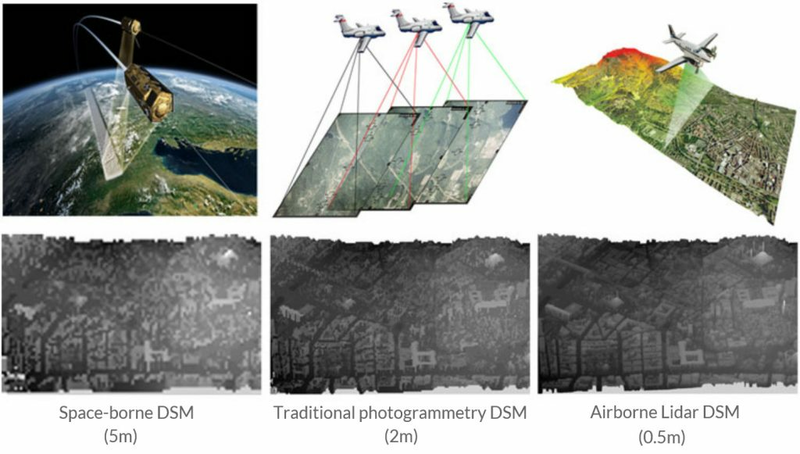 Remote sensing data is collected at varying spatial resolutions. Remember that the spatial resolution represents that area on the ground that each pixel covers. Source: Colin Williams, NEON. Next week you will work with MODIS data. NAIP imagery is available in the United States and typically has three bands - red, green and blue. However, sometimes, there is a 4th near-infrared band available. NAIP imagery typically is 1m spatial resolution, meaning that each pixel represents 1 meter on the Earth’s surface. NAIP data is often collected using a camera mounted on an airplane and is collected for a given geographic area every few years. Compared to NAIP, Landsat data are collected using an instrument mounted on a satellite which orbits the globe, continuously collecting images. The Landsat instrument collects data at 30 meter spatial resolution but also has 11 bands distributed across the electromagnetic spectrum compared to the 3 or 4 that NAIP imagery has. Landsat also has one panchromatic band that collects information across the visible portion of the spectrum at 15 m spatial resolution. The bands for Landsat 7 (bottom) vs Landsat 8 (top). there are several other Landsat instruments that provide data - the most commonly used being Landsat 5 and 7. The specifications for each instrument are different. Source: USGS Landsat. The Moderate Resolution Imaging Spectrometer (MODIS) instrument is another satellite based instrument that continuously collects data over the Earth’s surface. MODIS collects spectral information at several spatial resolutions including 250m, 500m and 1000m. You will be working with the 500 m spatial resolution MODIS data in this class. MODIS has 36 bands however in class you will learn about only the first 7 bands. In the next lesson, you will learn how to work with NAIP imagery in R.